Brick cape cod with many updates & spacious garage & workshop area! Updates include: remodeled bath, walls opened between DR & KIT w/granite counters, stainless appliances, pantry cabinets & built-in shelves. Lots of charm too: red oak wood floors, arched doorways, glass doorknobs & stone fireplace. Large replacement windows overlooking front & back of house w/view of established perennial garden, fenced back yard & beautiful sunsets! Flexible floor plan, spacious 2nd floor with .5 bath is perfect for sharing. 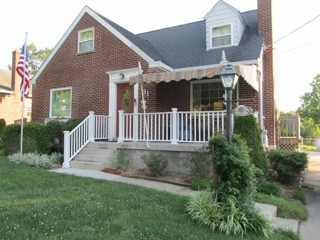 New front porch with awning, backyard patio too. Large driveway for parking! This listing courtesy of, Rawlings Realty & Auctions .